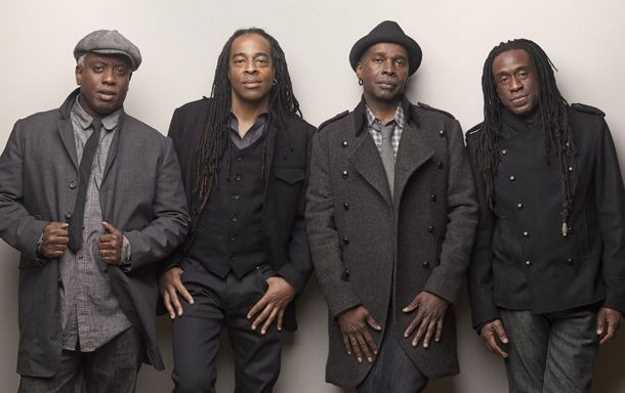 If you are a long-time fan of hard rock, then you ought to be very familiar with the New York City band Living Colour. Hit singles like "Cult Of Personality", "Love Rears Its Ugly Head", "Time's Up" and "Leave It Alone" continue to live on with radio airplay. Yet Living Colour is far from living in the past, as the quartet released a new studio album last year, 2017's Shade. Many people rediscovered Living Colour when former WWE Superstar CM Punk began using "Cult Of Personality" as his ring entrance music. But as it turns out, the WWE stage wasn't the first time that Punk had used "Cult Of Personality" in a sports setting. This was addressed when I spoke with Living Colour guitarist Vernon Reid by phone. Outside of Living Colour -- which also includes vocalist Corey Glover, drummer Will Calhoun, and bassist Doug Wimbish -- Reid is also an accomplished photographer. This tied in with some sports talk during our phone conversation. Reid, who Rolling Stone was named as number 66 on the list of No. 66 of the "100 Greatest Guitarists of All Time," can be followed on Instagram via @vurnt22, while Living Colour keeps an online home at http://www.livingcolour.com/. A lot of people rediscovered Living Colour because of CM Punk using "Cult Of Personality" via the WWE. Did that lead to other people wanting to use your music? Vernon Reid: The thing with CM Punk was a very personal thing for him. His Little League team used to use that music. He had a connection to it from when he was real young, you know? The song is kind of a weird perennial, it's been getting some plan now because of one of the political commentators Jay Kaplan played "Cult Of Personality" in regards to talking about [President Donald] Trump. It's so funny it's had multiple lives with Guitar Hero, CM Punk, and it having relevance in the political discussion. Living Colour put out a new album last year. Can you tell me what you and the band are currently up to? Vernon Reid: We just played the Wisconsin State Fair yesterday. We played a couple of songs from our record Shade. We have an upcoming tour of Australia coming up. It looks like we're going to be doing dates with Fishbone that we're very excited about. The work continues. We're out there fighting the good fight. People know you as a guitar hero, of course, but when you're not busy with music, what do you like to do with yourself? Vernon Reid: I love photography. I started taking pictures, just kind of being on-tour, years ago. I met some really excellent photographers that gave me a lot of valid pointers about what to do and what not to do. I wound up being exhibited a couple of times. John McEnroe bought a couple of my photographs. I was in a show at the Brooklyn Museum. That's a passion of mine. I regularly post on Instagram, my Instagram is @vurnt22. You can see some of my stuff there. Last year I did 365 pictures, literally a shot for each day. I cured myself of that insanity. (laughs) That was bananas. I love it. That, and I've done multimedia [art] because I really started with visual stuff and then I became a musician. Photography kind of brought me back into the visual stuff. You just mentioned John McEnroe bought stuff of yours. That has nothing to do with you being a sports fan? It's just that he has great taste? Vernon Reid: He has great taste. (laughs) But he's also a musician. There's a lot of crossover between musicians, actors, comedians, and sports people. Prince was a really good basketball player. There are a bunch of actors who are really awesome musicians. Steve Martin is actually a better banjo player than he is a comedian, and he's an iconic comedian, but an amazing banjo player. But there's a lot of crossover in those worlds of entertainment, people that are into other things. So in closing, Vernon, any last words for the kids? Vernon Reid: Keep watching the skies, keep the powder dry, don't take any wooden nickels, and find what you love and do that.